Thirteen lettered tiles. Sixty seconds. Go! 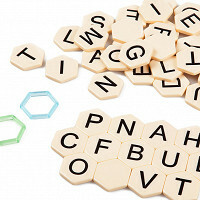 Find as many words as you can in Lexigo RUSH, a head-to-head game of stringing letters together. 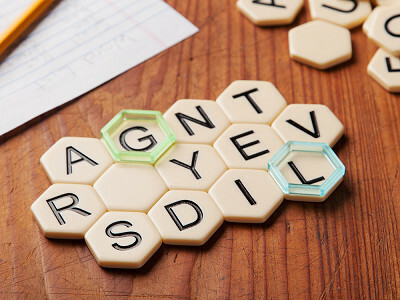 Arrange the tiles into a honeycomb-shaped game grid, start the timer, and the rush is on. Form words letter-by-letter along a continuous path, but work fast and get creative because only words no other player has earn points. To up the challenge, Maker Wiggles 3D (creator of Randomonium) added a few twists. The same tile can be used twice in a sequence. And blank tiles are a wild card, representing any letter a player needs. With three sixty-second rounds per game, the stakes rise in each. Bonus brackets are placed on certain letters. Any word using a bracketed letter earns double points. This entertaining, educational new take on linguistic competition is, in a word, fun. Lexigo RUSH is a straightforward, but challenging game. 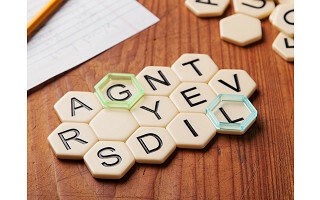 Each player has just 60 seconds to find as many words as possible using the tiles in the grid. Be creative, and we hope you'll have fun. Happy to answer questions today. How is this different than Boggle? Hi Susan, one of the major differences is in Lexigo RUSH you can use the same tile more than once in the same word which is not allowed in Boggle. Another difference is the presence of a blank tile. And lastly, bonus brackets in the second and third rounds kick are new as well. Each adds a new, creative wrinkle. 4) We've developed a great app - Wiggles 3D Game Box - that handles scoring, timing and has a custom dictionary! Our dictionary includes many proper nouns including people first names, places and many brand names. Isn't it difficult for the player who is seated where they have to read the letters up-side-down? @William Hi William, If Lexigo RUSH is being played with 2 or 3 players there is no problem. With 4 players we suggest that each round the grid is assembled facing a different player. We have the grid being assembled by a different player each round to keep everyone involved. For rounds 2 and 3 when bonus rings are added, it keeps it fair if a different player does the random array of letters and placement of the bonus ring or rings. Hi Elisa, 46 tiles are provided with 13 distributed for each turn. 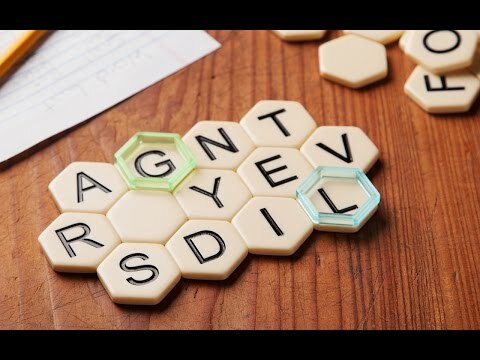 Don can correct me if I'm wrong, but the player assembling the hexagon pattern can look at the letters as they put them in place so there won't be an abundance of consonants or issues like that. @Mike Hi Elisa, we find that a random draw of letters always provides an interesting grid to work with. Part of the fun is the random nature of the draw. We generally don't find it necessary to 'manage the the tile selection' in any way. We do not have a Q in the assortment so that avoids that problem. I would mention that the grid is replaced after each round so 39 letters are used each game. The addition of the blank tiles also helps ensure that there are always vowels or consonants in abundance. Have you considered coming up with a math version? Interesting idea, Patrick. Did you have a thought for how it could be adapted? Thirteen lettered tiles. Sixty seconds. Go! Find as many words as you can in Lexigo RUSH, a head-to-head game of stringing letters together. Arrange the tiles into a honeycomb-shaped game grid, start the timer, and the rush is on. Form words letter-by-letter along a continuous path, but work fast and get creative because only words no other player has earn points. To up the challenge, Maker Wiggles 3D (creator of Randomonium) added a few twists. The same tile can be used twice in a sequence. And blank tiles are a wild card, representing any letter a player needs.